Stuttgart is an amazing city in southern Germany, full of things for families to do. Sometimes it takes a bit of courage to head out to a place you’ve never been in a foreign country. 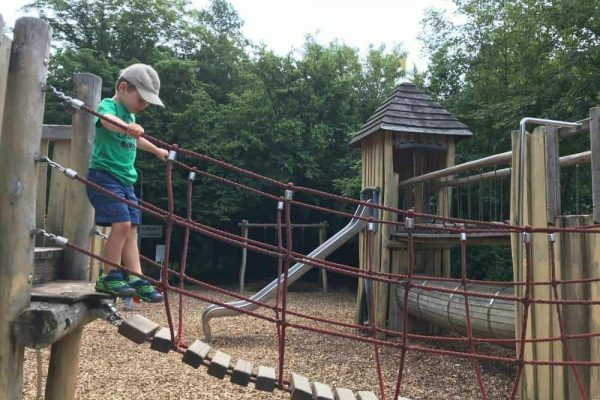 Hopefully, my tips and tricks will help you enjoy some adventures out with the kids to some of Stuttgart’s attractions, like the Stuttgart Zoo (Wilhelma) or the amazing playgrounds (spielplatz) . With so many places to visit in Stuttgart, i’ll try to narrow it down to the best places and why you should go. So here we go! 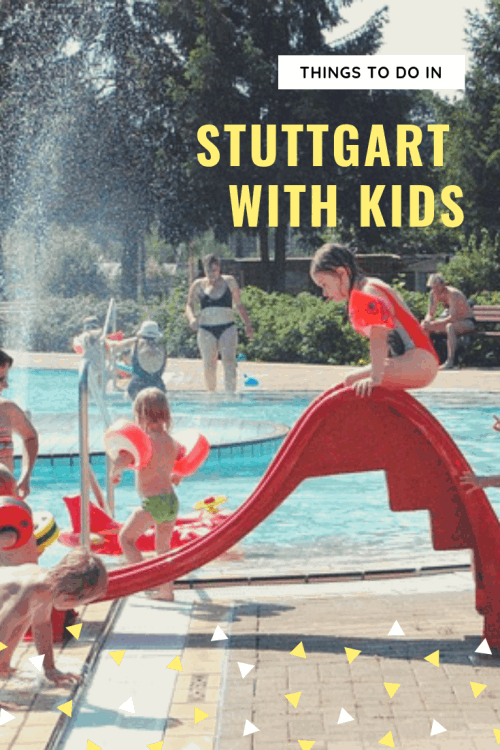 Here are the best things to do in Stuttgart, Germany with kids! This is one of the first places that I visited when I moved to Germany and one that I highly recommend if you visit Stuttgart. It is a fabulous green space located just north of downtown Stuttgart, Germany. Killesberg park is the place to visit on a beautiful day. It is also packed with tons to do, so plan to spend at least a few hours if not 1/2 a day.This is also a great first place to start when beginning your Stuttgart sightseeing. We typically drive. So you can park along Stresemannstraße and walk into the park (uphill). Or my favorite, park in the neighborhood off Thomastraße, 70192 Stuttgart. We like this parking spot because you can head right into the park from a gate and it’s a relatively flat walk to the observation tower and then onto the playground area. Killesberg park has everything! Multiple Biergartens, an observation tower, train ride around the park, carousel, huge playground, petting zoo, botanical gardens and more! This is a large park, so if you have small kids, bring a stroller or foldable wagon. We also bring cash for food, coins for animal feed and to climb the observation tower. *Read more about Killesburg on Stuttgart Tripadvisor! We were frequent visitors to the Stuttgart zoo. Even in various weather types, there is plenty of indoor and outdoor attractions to keep everyone happy. It was one of our favorite Stuttgart attractions. I usually drive because I I live down by Tubingen and it would be too many connections via the train, but there are two stops just in front (Wilhelma) and to the side of the zoo (Rosensteinbrücke). If you drive, there is a large parking garage. It is to the left of the entrance and a bit hard to find with all the construction. Here is the address. I recommend arriving early because, on busy days, the parking does fill to max capacity. Make sure you keep your ticket so you can pay before you exit. Once you’ve parked, follow the zebra stripes to exit the parking garage and turn left to head towards the ticket windows. If you don’t want to interact or you feel nervous speaking German, you can use the automated ticket machines. Then show your ticket and you’re in! Animals! The zoo can be a bit confusing when you first enter, so grab a map, or check out their website for suggested tours around the park. We typically went in a counterclockwise direction. For example, this path is great for strollers with no stairs along the way. 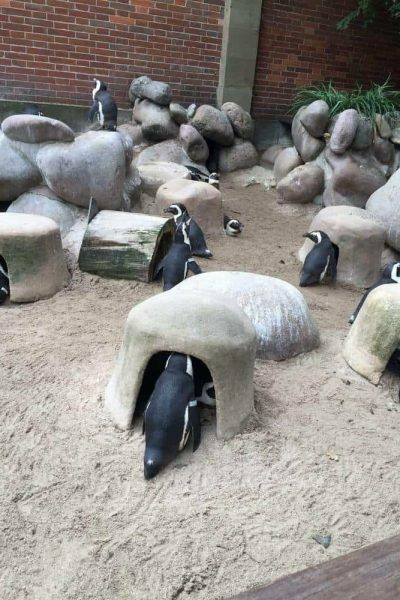 Highlights for us included the various monkey exhibits (located inside and outside), the playgrounds scattered throughout the park, the sea lions, penguins, African animals and the petting zoo located at the back of the park. We were always able to see tons of animals and they were active during all of our visits. 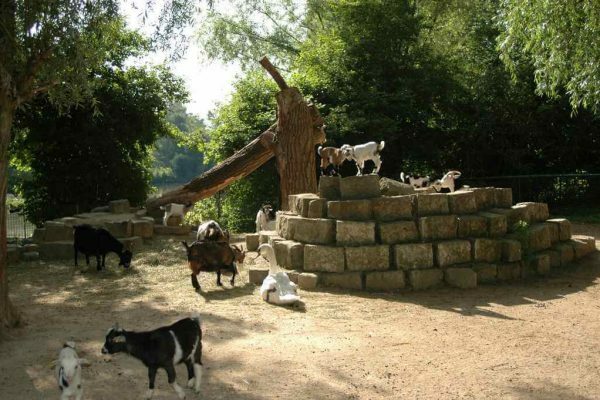 The Stuttgart Zoo is a large park, so if you have small kids, bring a stroller or foldable wagon. We also bring cash for food, snacks on the go, and a picnic if you don’t want to buy food from the two restaurants at the zoo. There are two major restaurants and a few food stands throughout the zoo. The restaurant located towards the front of the park is a favorite due to its kid-friendly indoor playspace. There is a small fenced area towards the back left of the restaurant (near the restrooms). Food is German style and buffet. Grab what you want, pay at the cashier and clean up your dishes when you are done with the tray holders scattered around the restaurant. 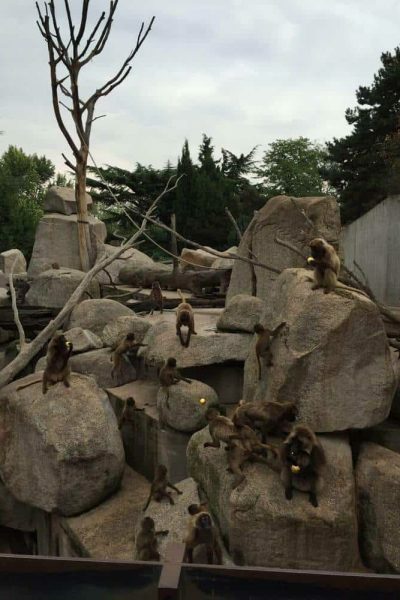 However, we were usually at the back 1/2 of the zoo when the kids started to get hungry. The restaurant in the back of the zoo is similar with its buffet style and German fare. There are great indoor and outdoor seating options with high chairs and little outdoor play spaces to keep an eye on the kids. If you don’t want to pay for food, bring a picnic, there are no restrictions on bringing food into the park. Check their website for special events. Last year they let kids in for free for Halloween and the zoo was decorated. *Read more about Wilhelma on Stuttgart Tripadvisor! 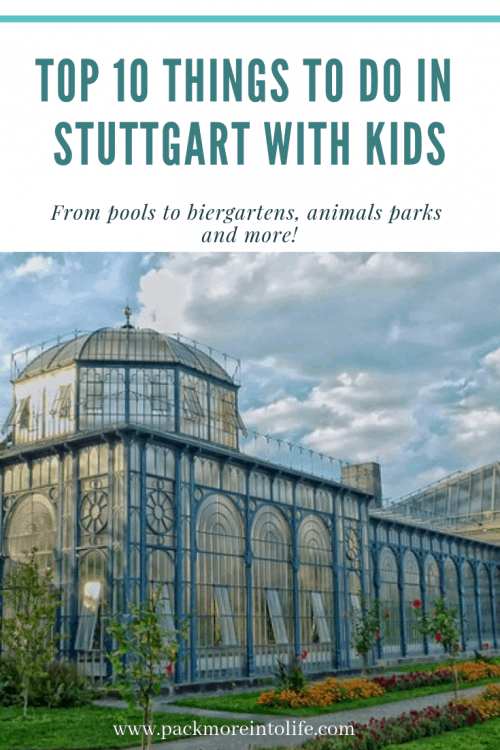 This is a fun alternative to a zoo when you visit Stuttgart and where your children can feed animals and get lots of interaction. We frequently visited both Pforzheim and Nymphaea as day trips. 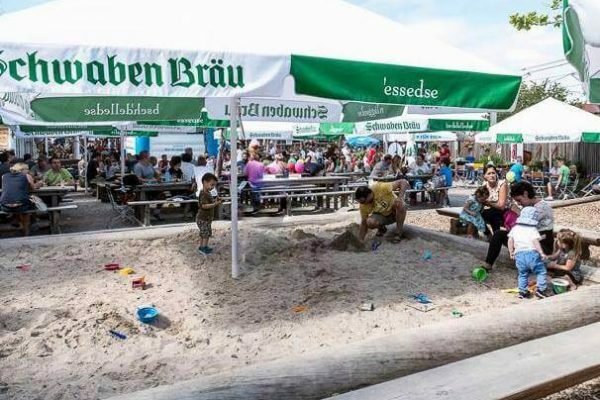 They both feature playgrounds, a Biergarten, and some parking. This it is the larger of the two animal parks. 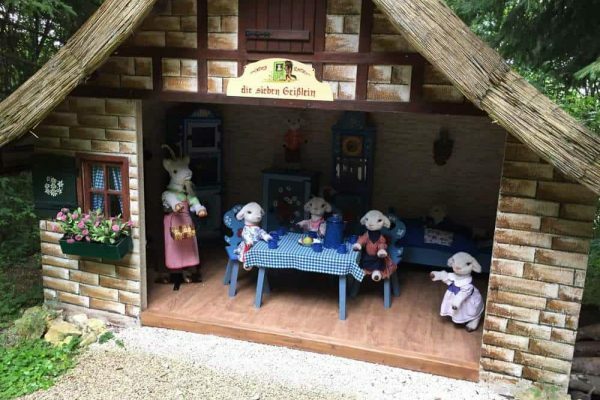 In my opinion, it is a bit more rustic, but also larger if you need something to occupy the kids for at least 1/2 a day. There are 3 large parking areas which is nice because you’ll likely drive since it is located 30 minutes from Vaihingen. Again, we like to arrive early to get a good parking spot and avoid the crowds. Around 10 am was typically a good time unless it was a kindi holiday or nice weekend. Parking also opens up in the afternoon around 3 pm, but you might have to circle the parking lots on kindi holidays or weekends. Bring coins to pay for parking, the parking machine DOES NOT give change. It is 3 Euro per car Mon-Fri (3 hours) and 5 Euros per car Sat, Sun and public holidays (3 hours). We usually stayed longer than 3 hours without any difficulty with paying again. Once you’ve parked, paid for parking and placed the ticket inside your car, head over to the entrance. Visiting the animals! When you first arrive, you’ll see the bathrooms located to your right and a Biergarten to your center and left. Continue walking and you’ll see a small wooden building (if the door is open, you can buy boxes of food here). If it is closed, walk over to the dispensing machines. You have to use a 2 euro coin, that’s the only option. There are cups to put the feed into. TIP: bring a bucket or container for your child to easily carry and feed the animals from. 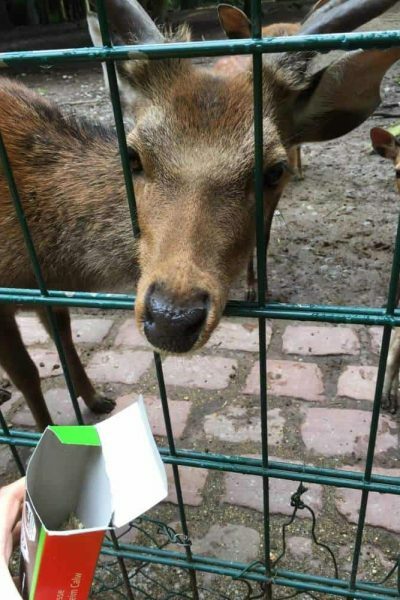 We usually grab our food and head into the petting zoo first. Then we head left up to the larger animals (you can feed the majority of these animals). We double back a bit after visiting with the Moose. You’ll see a path on your left (just before the playground area). This playground is best for the older kids, we stop at another playground towards the end of our visit for the little ones. You can stop and play for a bit before continuing down past the pigs and towards the Wildcats (one of our favorite areas). You can’t feed any of the Wildcats, but they are fun to spot in their cages. 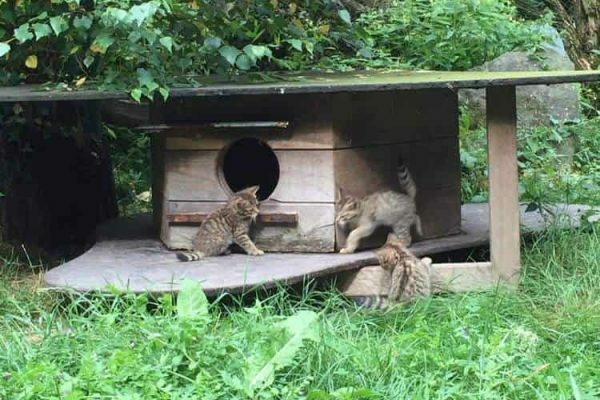 One year a mother cat had 3 little kittens and they were adorable and so fun to watch! Then you can either walk behind the animals around the back or head back down past the pigs onto the main “road” down the center of the park. This will take you past the large enclosures with Bison, and various deer. You’ll end up down by the ponies. Take a right when you see the road in front of the ponies. This will bring you near the Highland Cattle and near the entrance to the children’s area. We like to keep this for the middle of the trip because the kids are most excited about this area. You’ll be able to feed the sheep, rabbits, guinea pigs and a few other animals, so make sure you still have some food left (or buy more at the vending machines). Enter the children’s area and park your stroller. There are logs to help the little ones peer over the fencing. Make sure to note the green (ok to feed) and red (please don’t feed) signs. There is also a cute wooden train to climb around on. Once you exit, you can either head to the smaller children’s playground (spielplatz) or head to the Biergarten. The Biergarten is a favorite for lunch with ice cream on a warm day. There is plenty of outdoor seating and some covered and indoor seating. Check out the park map here. I’d suggest a stroller or foldable wagon. The terrain is a bit uneven in areas, but not terrible if you want to bring an umbrella stroller. We like larger strollers just for the ability to pack snacks and hold the food containers. The park is mostly tree cover, but bring sunscreen on a sunny day or a hat. 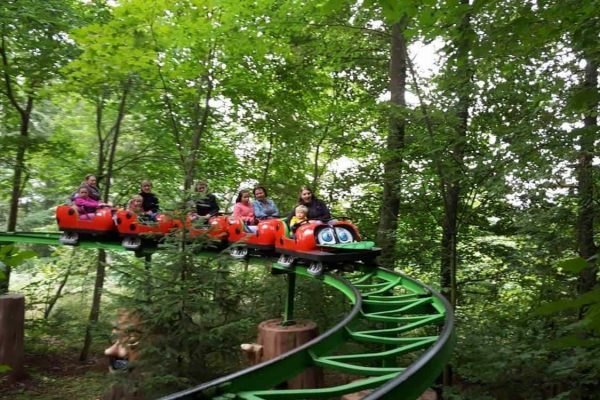 *Read more about Wildpark Pforzheim on Tripadvisor Stuttgart! This is another fun animal park. It is smaller, much more compact and doesn’t have many close parking spaces, so heads up. However, it is easier to navigate and great for a quicker trip. It is also located 30 minutes away from the Vaihingen area. 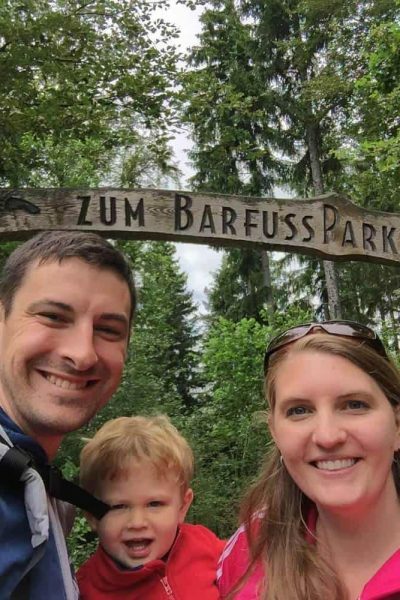 When my mom friends were looking at what to do in Stuttgart, this wildpark was always on my list because it’s a great mix of family fun. Another place to drive to. I’m sure you can also figure out public transportation, we just didn’t rely on the train system much. There is parking for perhaps 20 cars along Nymphaeaweg. The park opens at 9 am, so I would plan to arrive as close to that time as possible. The “zoo” is located on an island, so if you don’t find parking, you’ll have to turn around, head back down the road and find parking elsewhere (which will include a bit of a walk). 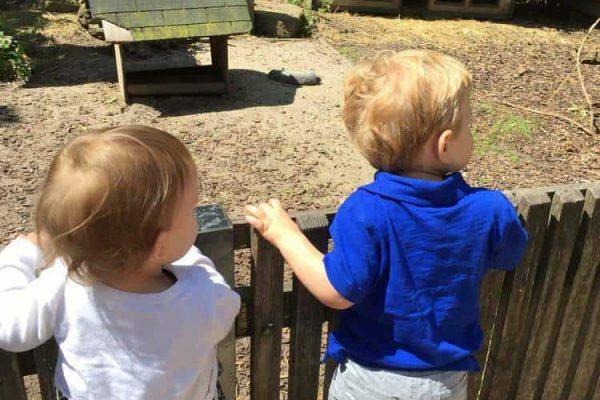 Interaction with animals, playground, Biergarten and information to learn more about animals. There is a cost to enter, it is free for children under 6 years of age and 3-4 euro (depending on the time of year) for adults. You can also purchase food to feed the animals. I’d only buy one box because they don’t seem to consume as much as at Pforzheim. It is mostly a one-way path around the animal encounters. You’ll make a counter-clockwise path around the pond with a few one-way walkways to visit animals. After your visit with the animals, you can grab food at the Biergarten and let the children enjoy playing on the playground. Another great place to spend a beautiful day outside. If your children are older and enjoy walking, you’d be ok without a stroller. 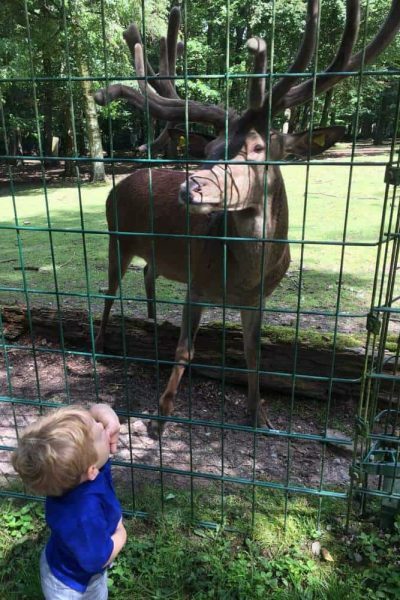 But younger kids will enjoy getting in and out as they see animals. The paths are easy to navigate and there aren’t any stairs to contend with. 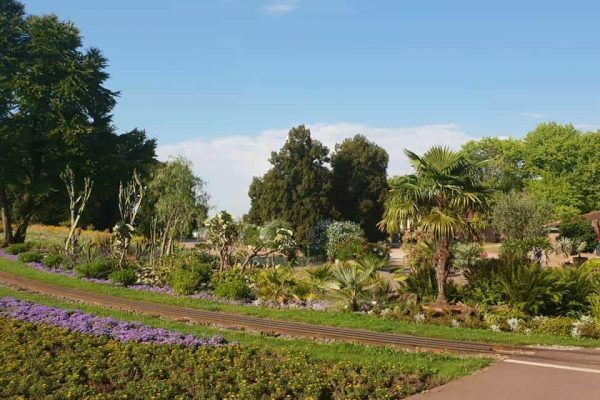 *Read more about Nymphaea Zoo on Tripadvisor Stuttgart! Traumland was a favorite of our before our son turned 3. It was the perfect “beginning” theme park and caters to smaller children, allowing them to ride and enjoy almost all of the attractions. Another bonus, kids are free until they turn 3! You’ll need a car. It’s almost an hour drive from the Vaihingen area. There is plenty of parking, but the early bird gets the best parking and the ability to check out the park before the crowds (especially on the weekends). Parking is free. This park is wonderful because it features fairytales, rides, attractions, playgrounds and pony rides (Looks like the pony rides are gone and there is a new kart track to explore). Once you park, you’ll head up the hill to the entrance (curve left around the playground and up to the right). Pay for your entrance ticket and then enter under the gate. You have two options: continue right through the fairytale forest (typical path) OR head left towards the rides (skipping the long path through the fairytale). We took the right-hand path a couple of times, but then our frequent visits made us head left to catch the rides and start the fun. Like I said before, most of the park is accessible for smaller kids. Included a train ride, small “roller coaster”, Ferris wheel, playground zones, water play area, and more. 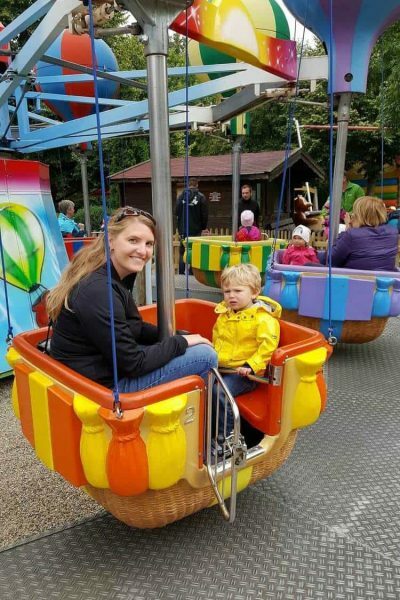 There are a few rides for older kids: water ride (ages 4 and older), carpet slide (although we saw parents taking their children at much younger ages and so did we), larger roller coaster located near the smaller one, slingshot (boat ride), and the pedal car track. One of the best parts about Germany is the great food options available at the parks or the ability to bring in your own food. Traumland is no exception. There are quite a few food options and they are huddled around the center of the park. 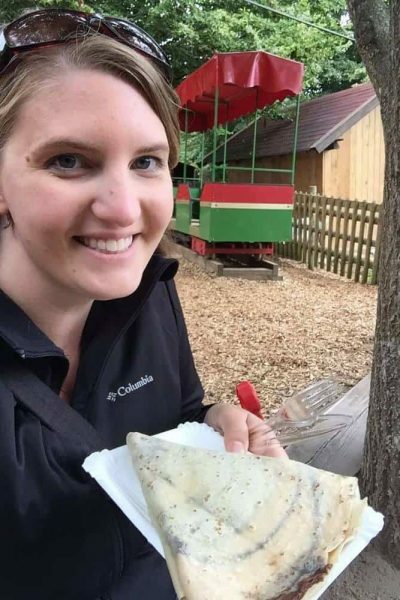 Our favorite was a crepe stand where you could get savory crepes with ham and cheese, as well as small pizzas. They also have the typical German fare. 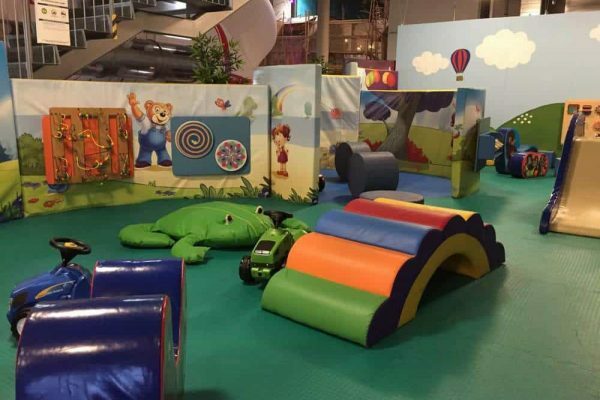 If you need an indoor option, there is a building with a cafe/bakery and it features a soft play zone in the back. Otherwise, you can find a table near the large playground area where you can (hopefully) eat in peace while the kids play. 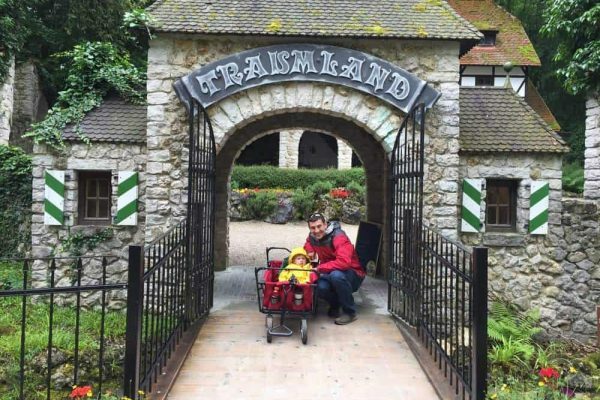 You’ll want a stroller or carrier for the little ones (for ease of hopping on and off rides). It is mostly dirt paths and doable with strollers of varying types. If you don’t want to buy food, bring a picnic and plenty of drinks to stay hydrated. *Read more about Traumland on Tripadvisor Stuttgart! A Bafusspark is one of the unique places to visit in Stuttgart. So jump in with both feet! Feel the different textures of wood, stones, bark mulch, grass, glass and water with your feet. You’ll experience multiple sensations varying from warm, moist, dry, pleasant, stimulating and invigorating. 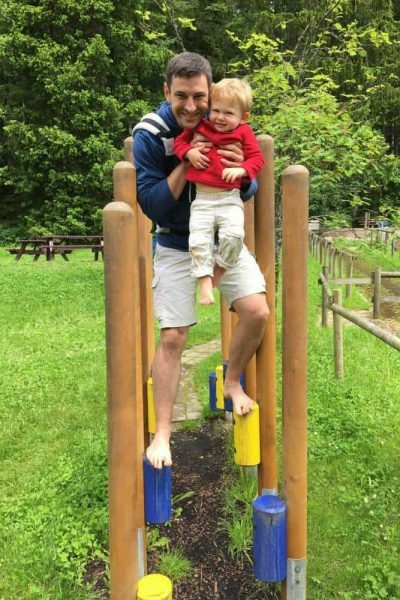 This particular barefoot park is about an hours drive from the Vaihingen area. So it would be another location where driving is the best. You’ll want to put this address into your GPS for navigation purposes. There are multiple parking areas. Bring 4 euro in coins to pay the machine (cards are not accepted). No dogs allowed either. 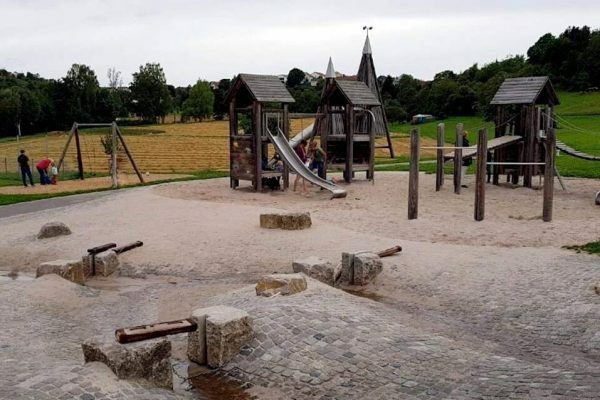 This is something really unique to the Stuttgart area, a barefoot park. So yes, prepare to take your shoes off, walk on the paths of multiple textures and enjoy the beautiful scenery along the way. 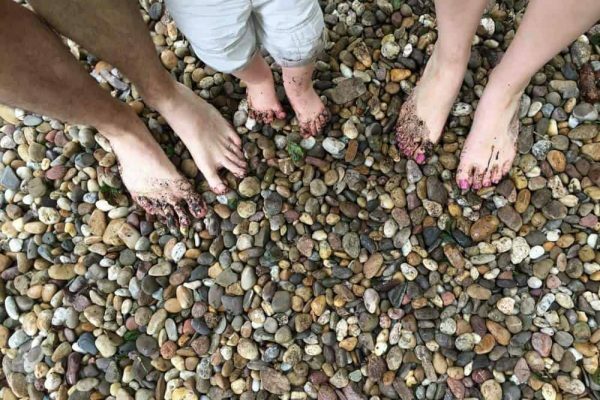 I’d consider this a family adventure since you’ll be carrying (or walking slowly) with any little ones. It is seasonal and only open from May till October. I’d recommend going on a nice warm day because the water is really cold and walking barefoot can be chilly on cooler days. When you arrive, head to the locker area, bring a coin (1 euro deposit) for the locker too. Take your shoes off, store any items you don’t want to carry. Bring a backpack for any extra items like snacks, water and children’s items you may need along the way. Once you’ve stored your items make a suggested donation of 2 euro per person to enjoy the park and then head left to begin the path. Along the way, you’ll encounter obstacles, various textures, water pools, trampolines, and paths. There are two routes, a shorter loop and a longer loop (consider the ages of your children). 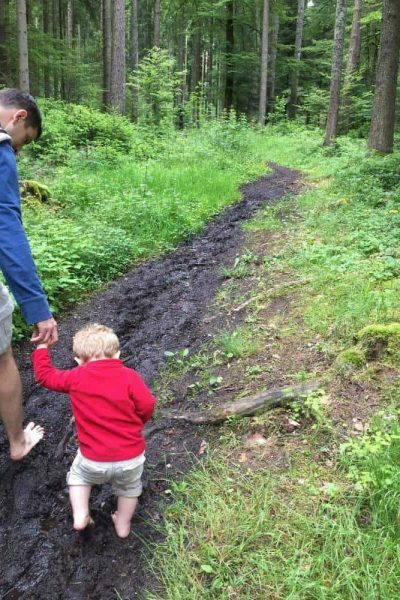 The longer loop includes a pit of mud, so if that’s part of the plan, take the longer loop. Even my husband (with his sensitive feet) did well on the path. This was also a fun activity for visiting family since it is unique to Germany. When you are finished, head over to the foot washing station, dry your feet and then grab your locker items and head over to eat or back to the car. There is a Biergarten at the entrance and eventual exit. It’s simple food and has limited hours, but a good alternative. Otherwise, you can find food in the towns surrounding the park. There are a few doner shops open if you plan your visit on a Sunday. You’ll need a baby carrier (that you don’t mind getting dirty) for little ones that can’t walk and also a spare set of clothing (they will get messy). Towels to clean and dry your feet. *Read more about the Barfuss Park on Tripadvisor! Indoor playgrounds aren’t usually Stuttgart tourist attractions , but honestly we love letting our son let lose and just be a kid. These are two options for indoor parks that are close to the Stuttgart area. There are a few that are a bit further of a drive, such as TobiDu Indoorspielplatz and Kikolino. I will focus on just the two originally mentioned since they were the most frequented by us and closest to the area. It was easy to drive to Sensapolis and the parking lot is large and free. You can park directly near the entrance for easy access. Once you enter the doors, you’ll arrive at the ticket desks. Here are some tips: if you don’t like paying 20.50 euros per person over the age of 4, then come at 4:30 pm and stay until they close (7:30 pm) for only 11 euros. We did this multiple times, especially before my son turned four and it was an awesome deal. Another alternative, get a yearly pass for 99 euros. This is a steal when the admission price for one visit is already 20.50 euros. You can even pay for one day’s admission and then upgrade to the yearly pass for a discount (20.50 off the 99 euro price). Both my husband and I grabbed annual passes, our son was free and we went all the time. Perfect for super warm days, rainy days and winter weather escapes. This is a massive indoor playground area. I’ve never seen anything like it in the over 20 countries we have visited. It is extremely clean, well staffed, organized and maintained. There are lockers (bring a 1 euro or 2 euro coin deposit) to store your belongings. We would actually ditch our shoes from the very beginning and just run around in socks. Keep at least one entrance card on you to pay for any drinks or meals you choose. Then you’ll pay the balance when you leave and check-out. Best area for little kids: there is a toddler area on the second floor off to the left of the spaceship. Go up the ramp and you’ll run into it. Another great area is over to the far right when you enter. 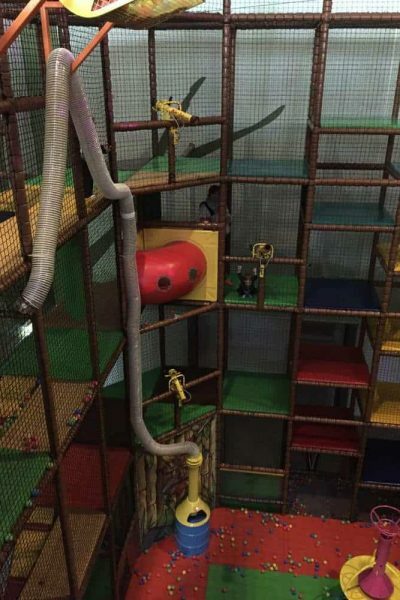 In the back, you’ll find a water play zone, pirate ship, and ball shooter climbing zone. Some families don’t like Sensapolis with little ones, I’d disagree. There is so much to do and see. You’ll want to avoid the busiest times to visit and it is a massive park, so pretty difficult with multiple children and only one parent. But evenings and right as they open on the weekends (for the first hour or so) are perfect. 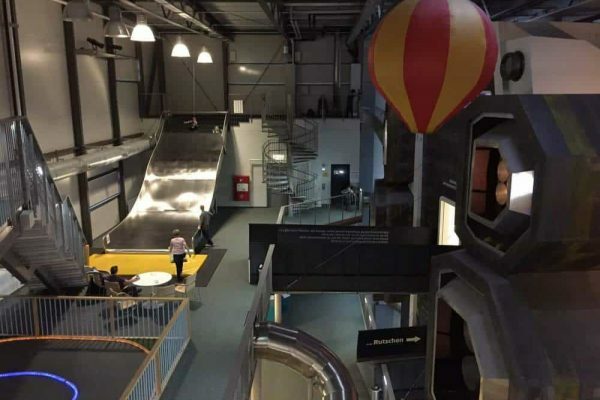 Best area for older kids: the spaceship with the daring slides, ball shooter with its climbing area, ride on tractors, science zone and the castle with its interactive rooms. We enjoyed the food service at the restaurant. We typically ordered their Asian fare with vegetables, rice or noodles and your choice of meat. The slushies were also a bonus with super sweaty kids. Bonus: if you become a member, you get a free huge slushie or a coffee and cake for your birthday. You’re not supposed to bring outside food, but no one is checking your bag. Just don’t be obvious or occupy a table with your picnic displayed. There are ample bathrooms and water fountains. Just bring socks. *Read more about Sensapolis on Tripadvisor! Bambilicious is located in Leinfelden-Echterdingen. Easy access to public transportation if that is what you prefer. If you drive, you’ll have to find street/neighborhood parking. Be sure to note the signs that say stickers are required to park on the street. Rewe is also an option across the street. It is an indoor playground for smaller children, I’d say best for the 4 and under crowd unless you have a timid 5-year-old. It features a ball pit, double slide, block building zone, trampoline, and climbing zones. Babies and toddler can enjoy a separate zone with age-appropriate toys. There are also games, puzzles and a wall for chalk art. In addition, there are ride on toys, a baby swing, and rocker. 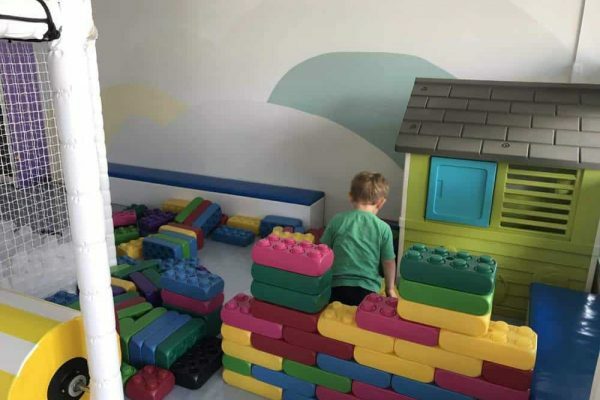 The main attraction for this indoor playground is the ability to catch up with friends and enjoy a coffee while the children play within sight. My mom friends and I frequented this indoor playground because of those factors. You pay at the end of your visit at the cash register located in the cafe. During busy times, it is recommended to make a reservation so you can secure your time to play and not be disappointed. There is a nice bathroom with a changing station. Free diapers and wipes. BONUS! They also have great packages for children’s birthday parties or private events (as low as 12 euro per child). Check their website for up to date pricing and details. I’d also like them on facebook to be aware of closing weeks (family vacations). You aren’t allowed to bring outside food. 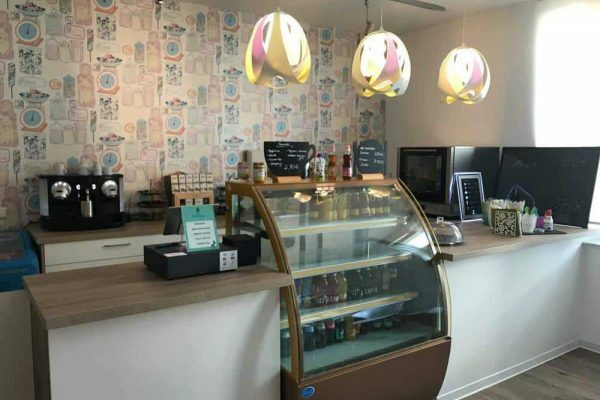 They make their money by selling coffee/tea/drinks and offering lunch style items. Socks for the kids, there is a small parking area for strollers and cubbies to store items before you walk in. Oh man! The Biergartens. They are quintessential Germany! When someone is headed to Germany in the warmer months, and they ask what to do in Stuttgart, I always recommend the biergartens. We loved Biergarten season and liked to bounce around to the different ones. 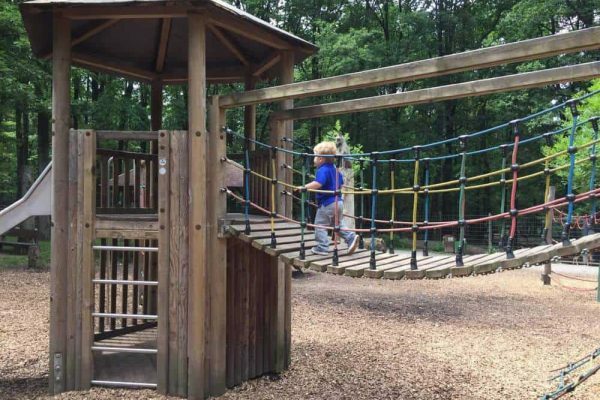 Here are three of our favorites due to their kid-friendly playgrounds and easy to reach locations. Easy to access in Leinfelden-Echterdingen. There is a large car park (but it fills up quickly) and public transportation nearby. 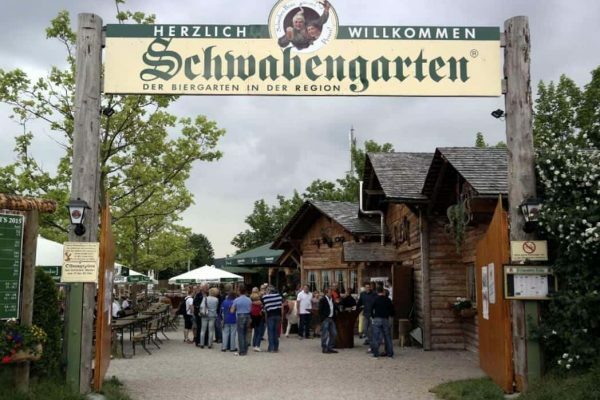 You’ll hear about this Biergarten frequently. We love it because the playground area is located at the back of the Biergarten and is surrounded by fencing (no escaping little ones)! We are able to find a table close by to keep an eye on things while they play and we enjoy a beer. The food area is easy to access through the turnstile. You’ll order, wait for your item (or get a buzzer) and then once you have everything, head to the check-out to pay. Make sure to pop the top of your drinks with the can openers at the end of the check-out. 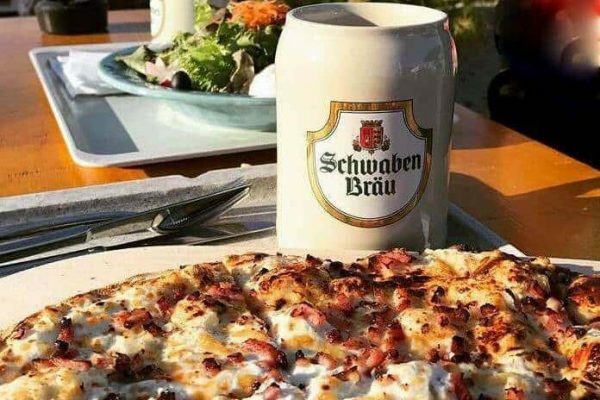 Our favorites include the flatbread pizza (flammkuchen), pulled pork sandwich, sweet potato fries, and roast pork with sauce and spaetzle. It’s rocky, so closed toe shoes are preferred, but certainly not required. I wouldn’t bring a stroller because it’s a pain to push it to the back of the Biergarten by the play area. However, if you must, it is doable. There are sand toys in the sand area, but feel free to bring your own if you prefer. Wipes are also nice to quick hand wiping between playing and eating. Katzenbacher is located just outside Patch Barracks. You could actually walk there, which we did a few times with the dogs. There are parking lots located directly outside the entrance and also down the street when it is a busy weekend or an event. Katzenbacher has a little bit of everything. It is much for laid back and a simple menu. We like the animals (bunnies, bison? ), the large playground area with large sand play zone and field to run and play. Dogs are welcome if you have them with you and they will host events (such as the soccer games this past year). This place has typical German fare and it’s pretty simple. We usually stick with the maultaschen and the warm bratwurst with a pretzel. On weekends and event days, they have a special side menu where you order inside and then pick up outside. Items like steak and flammkuchen. No sand toys are provided, so if your children like to play in a sandbox, bring those. There is a large grassy area, so bringing a ball would be ideal. This place is tucked up in a neighborhood, not far from Vaihingen. There is a small parking lot for maybe 20-25 cars (with some tandem spots if you are meeting up with friends). We really like the vibe of this Biergarten. It is laid back, full of German families and has lots of space for people to enjoy a nice meal. The playground area is huge and in the center with lots of tables surrounding it, making it easy to keep an eye on your kids. Go up to the window to order your food and pay. You’ll grab your drinks and salads (if ordered) and then find a table. There are digital boards where your order number will pop up when it is ready for pick up. There isn’t really a stand out meal here. It is typical German fare and all of it is pretty good. We like to try their “daily dish” which changes. You’ll find it on the black chalkboard sign or you can ask. There are some sand toys for the kids to use, but we typically bring some items. There is also a large grassy area if you want to bring a ball. 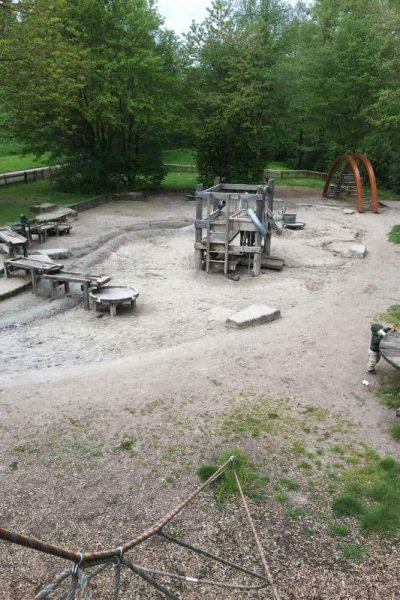 There are so many fabulous playgrounds in Stuttgart. I love driving around a town searching for the next new playground to discover. I’ll include some of my favorites at various locations with a brief description. Feel free to comment if you have another one that you’d like me to add. 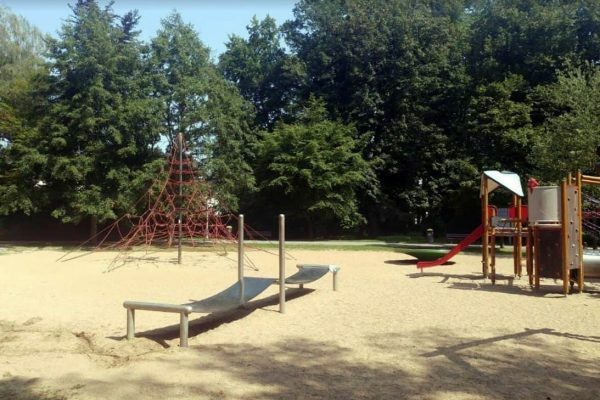 The best thing about German playgrounds is the uniqueness of each one. Some of our favorites include water pumps because what kid doesn’t like a good ole’ water pump to get messy. Herrenberger Str. 18, 70563 Stuttgart, Germany. Find parking on the street or walk from public transportation options. 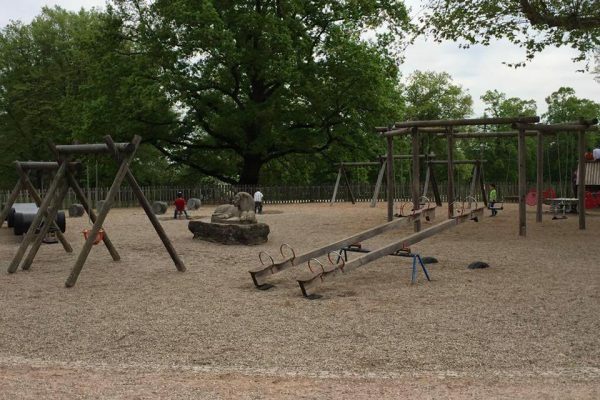 This is one of the first playgrounds we found. It is right across from the Pullman hotel and walking distance from our long-term rental when we arrived. We love this playground for the water play area, plastic wiggly bridge to try and cross, the climbing zones and circular swing zone. Bring a change of clothes or water play clothing to let the kids really enjoy themselves. Snacks and drinks are always a good idea for busy little people. There is also lots of green space for a picnic. We also bring sand toys in this awesome bag (lets all the sand fall through, but the toys stay in). There is a small parking area down by the playground and sports park area. This is a large park with a skate park, zip line, a soccer field, rock climbing zone, massive slides, sandbox, and traditional wooden playground. Sandtoys, picnic blanket to enjoy a seat in the grass (there are benches). Seestraße 17, 71063 Sindelfingen. *Use this address to located parking, then walk across the field and the playground is tucked in the trees off the path. This is a favorite for its huge climbing net, double-decker water play area, multiple pumps and the ability to create “rivers”, wiggly step climb and lots of sand. It is usually well shaded on a busy day and a great spot to meet up with friends because it is pretty condensed. Sand toys, buckets for water, water play clothing and a change of clothing. We also pack sunhats as added protection. We have two favorites: Sindelfingen indoor and outdoor pool and the Filderado complex. 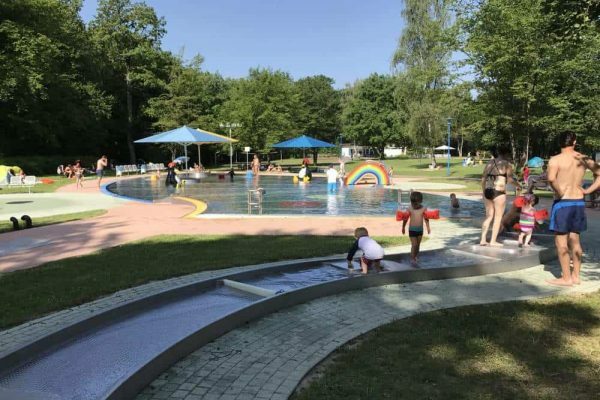 We love the pools in Germany for their family-friendly atmosphere. 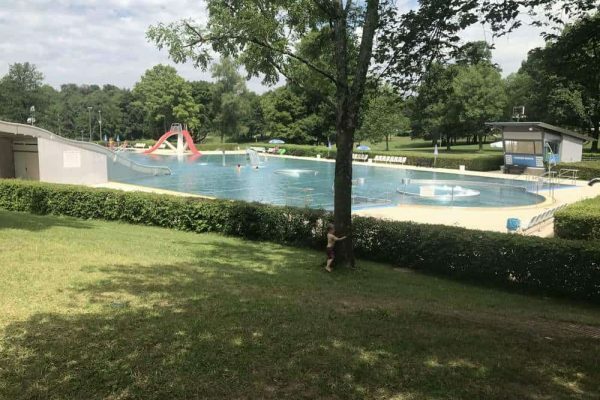 There are so many pools in the Stuttgart area, but these are the two that we frequented the most and hopefully, my tips will make your pool adventure less confusing. How to get there? There are multiple large parking areas for both the indoor and outdoor areas. The parking area at the top of the hill is the closest to the indoor area. You’ll walk into the complex, pay your entrance fee (given a card) and enter through the turnstile. There are multiple changing rooms, we use the first row (family rooms). You have to enter a changing room in order to get to the lockers. Use your card to lock the locker and then head into the shower/bathroom area. Make sure to shower before you enter the pool, it is a hygiene standard. Accessing the OUTDOOR pools: There is a separate entrance just down the hill. You’ll see two parking areas to the left and right of the road. Just passed the bicycle parking, you’ll see a building with a ticket window. Pay your entry and off you go. There are ramps down (next to the stairs) for wheelchairs and strollers. Continue around the second building for another ramp. You can exit from the side when you are ready to leave through the turnstile. The indoor pool features a wonderful toddler/kid play area on the left. We love the water play zones, slide, and low water depth. The water is also heated to a comfortable temperature. In addition, there are two larger pools. One for lap swimming with diving boards. The other pool is great for community swimming. The OUTDOOR pool has an abundance of play zones. 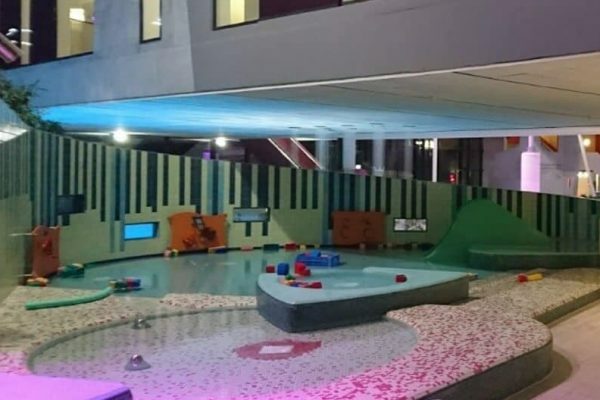 The kid’s area features a river with blocking tiles, two kids pools with slides, water features and umbrellas for extra shade. 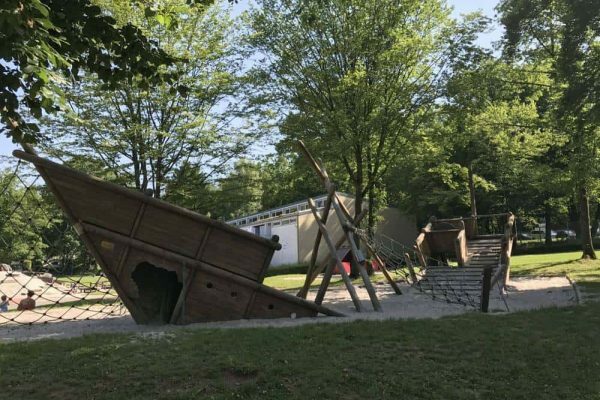 Located nearby is a large pirate ship with sand play, in-ground trampolines, a hill with water pumps that flow down to dammable trays and sand areas. There is also a large family pool with larger slides, water spray platforms, and bubble zones. It is located towards the center of the outdoor pool area. Down the hill is an Olympic sized pool with multiple diving boards. You’ll also see a long meandering slide down the hill. A fun slide for families to go together or older children. 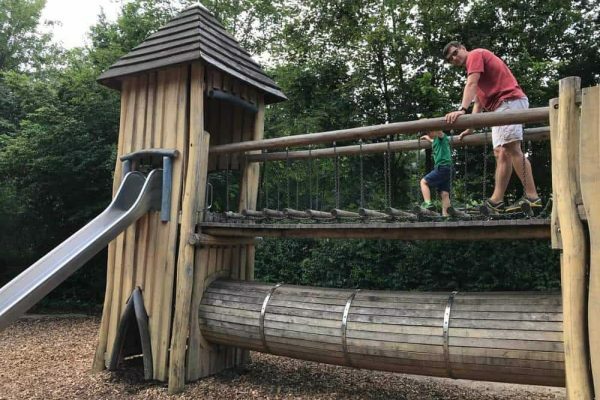 It does have a bit of a push at the end of the slide if you decide to go with your toddler. I’d recommend trying it out alone first. 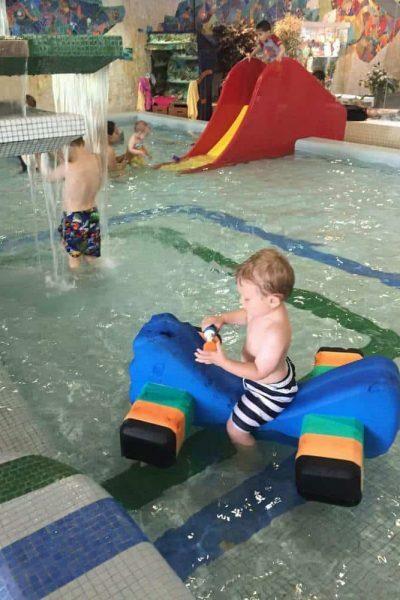 There aren’t any food options in the indoor pool. You can bring food to eat outside the pool on the deck. The outdoor pool has a restaurant at the back left near the courts and sand volleyball areas. It has typical German fare with a few tables to enjoy your meal. You can also grab and walk it back to your area, but it’s often hard to carry all the food without paying a pfand for a tray. For the indoor pool, you’ll just need your typical pool bag (suits, towels). I’d also bring some pool toys and floatation device for little ones. For the OUTDOOR pool, bring a blanket to sit in the grass, perhaps a sunshade (but there are plenty of trees) and any toys you’d like. We bring our sand toys and awesome bag (the sand falls out and the toys stay in). 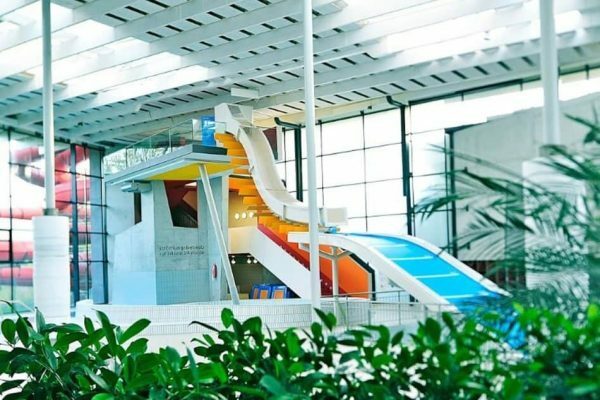 *Read more about Sindelfingen Freibad on Tripadvisor! There is a large parking area for easy access to the entrance. There is a digital board to help you locate a spot and tell you when a lot is full. You can see the digital board as you enter. Head towards the entrance and get your digital bands. Each adult receives a band. You’ll use this band to enter the facilities, open/close your lockers, and purchase food/drinks. It is a family style changing area. You can access the lockers directly or use a changing room. Then you’ll split up by gender into the shower/bathrooms. Both genders will exit back into the main stairwell. Take this stairwell down to the pool area. Please make sure you shower before entering. It is a large complex. Around the stairwell to the left is the kid’s zone. You’ll see various pools with a small slide. There are fun lego’s to play with and some interactive water wall displays. The water features rotate through the bubbler, dolphin water shooter and kids “hot tub”. Straight ahead as you exit the stairwell is the wave pool, deep pool with a side “lazy river” and the entrance to the two slides. The wave pool and the “lazy river” rotate. 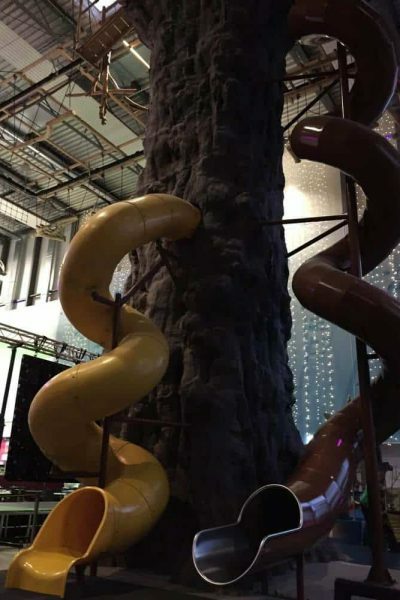 The two tube slides and the intense drop slide are located in the back corner. The best part about Fildorado are the tube slides. The slide on the left, you are able to sit with your child for the ride. 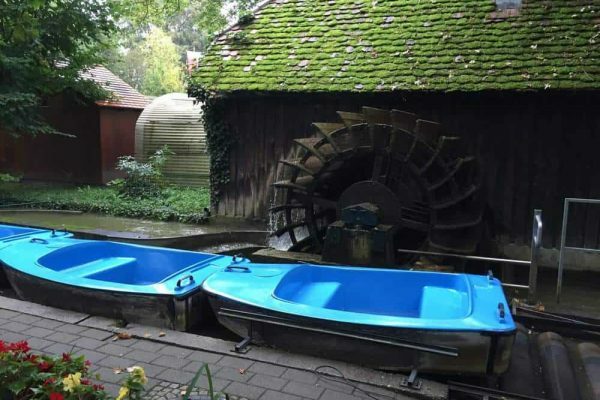 Try it out before you decide to go, but it’s rather slow and you can lift them up towards the end for a fun wet ride. The slide on the right is darker, best with a tube and has a waterfall at the end. It wasn’t as preferred for my little one, but another option. 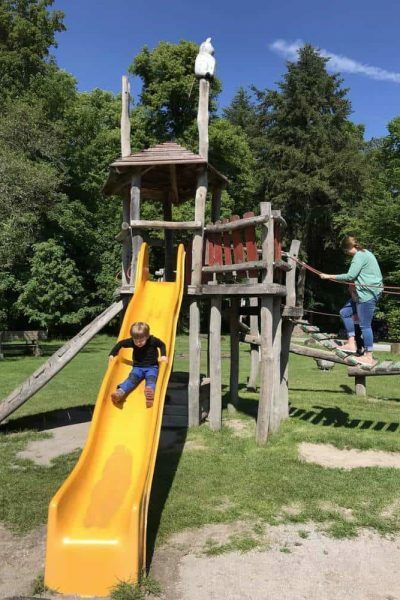 You can also enjoy racing your family down the slide with the fun timer. Who can go the fastest? Around the right from the stairwell is the Olympic pool (mostly for swimming laps) and then a nice warm saltwater pool that leads to the outside. This is a fun pool year-round. Fildorado has a nice restaurant area behind the stairwell. The food was always good, especially the daily special. My son seemed to always locate the shark sugar cookie. You can also bring food into the pool area. We attended a few birthday parties with homemade cakes, sandwiches, drinks and more. Bring the typical pool items. They do have arm floats if you forget your children’s, located near the staff area in a large bin. We like to bring a few pool toys to keep things interesting. *Read more about Fildorado on Tripadvisor! You can either take public transportation or drive. I like parking off Mömpelgardstraße, 71640 Ludwigsburg. There is a long row of parking areas with a pay machine. It does fill up in the morning, so arrive early. We like this side location because there is also a great entrance here. Saves walking through the gardens. The side location is also a ticketed machine. Scan your ticket and enter via a turnstile (big enough for strollers). 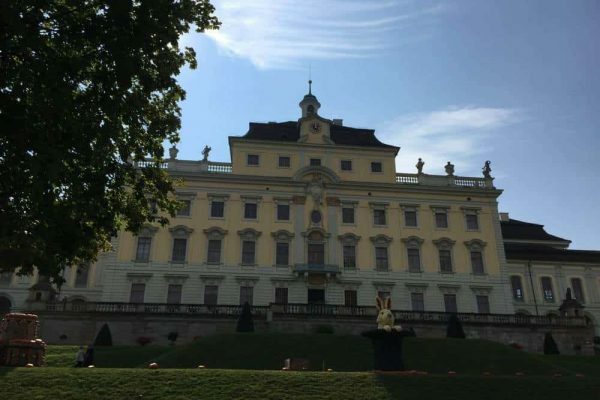 At first, I wasn’t sure what Ludwigsburg offered other than the palace (which we knew wasn’t going to happen with a toddler). Then we discovered the amazing children’s garden! Tip: It’s best to enter the garden from right outside the palace (down the treed path to your right). 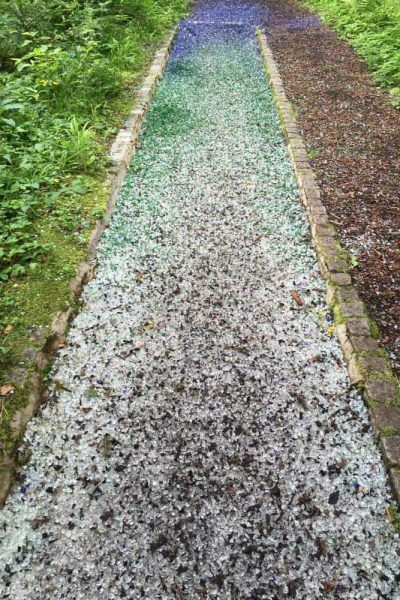 This will allow a downhill path, you’ll thank me! 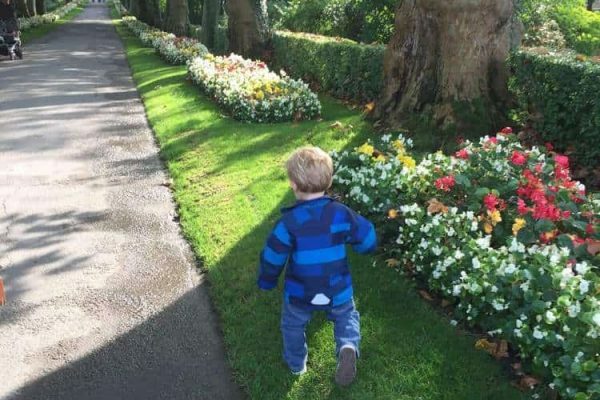 Even during the famous Ludwigsburg pumpkin festival, we still take the path through the children’s garden to play before we make our way onto the grounds for the official festival and a delicious lunch (more on that soon). Head down the treed path down to the large pond with a fountain. Once you make it to the pond (or just before), take a left and follow the path down through the fairytale displays. Soon you’ll see an entrance into a labyrinth/maze. It has a really fun surprise when you make it into the center. Just outside the maze, there is a donkey that will spit out chocolate coins if you insert a few coins. A fun surprise. Continue to meander downhill on the path. Follow the signs if you have a stroller so you don’t have to deal with the stairs. The fairytale exhibits are scattered along the way but are all in German (including the signs). As you reach the bottom, you’ll notice a cute boat ride. It is free and included with your ticket. Park your stroller and jump in line. Two adults and two children can enjoy a boat ride together. Next to the boat area is another fun “throne” where you can sit and enjoy a fun water show. If you want to pay a little bit for a train ride, continue further into the back of the park. If not, head out near the water throne/boat area into the main area for the festivals. The pumpkin (Kürbis) festival is a favorite! The displays are truly amazing and beautiful. Be sure to walk around the whole area to see them all. There are wooden boardwalks set up for strollers/wheelchairs to have ease of access. In addition, they set up various tents for food options. 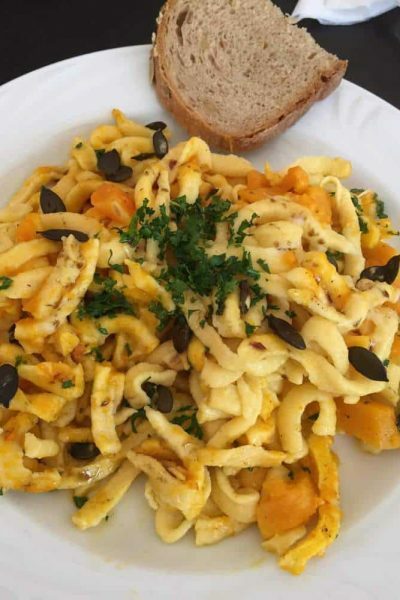 The pumpkin spaetzle is actually really good! So is the pumpkin prosecco. 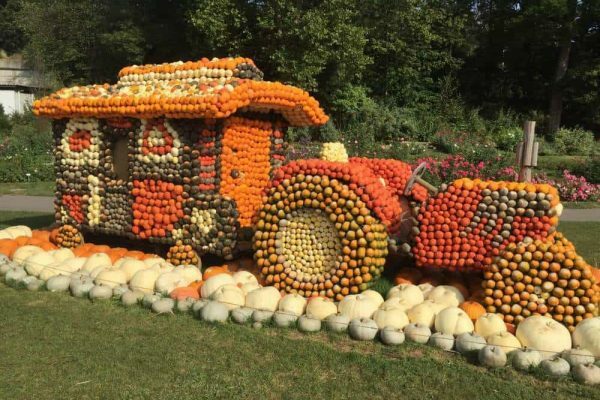 I’m not a huge pumpkin fan, but I thought the food was a good balance of pumpkin and flavor. 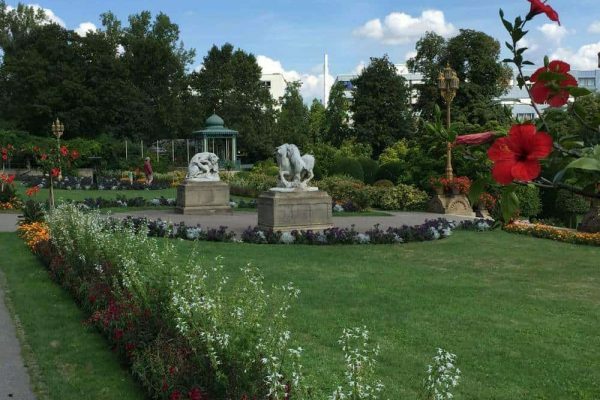 *Read more about Ludwigsburg on Tripadvisor! 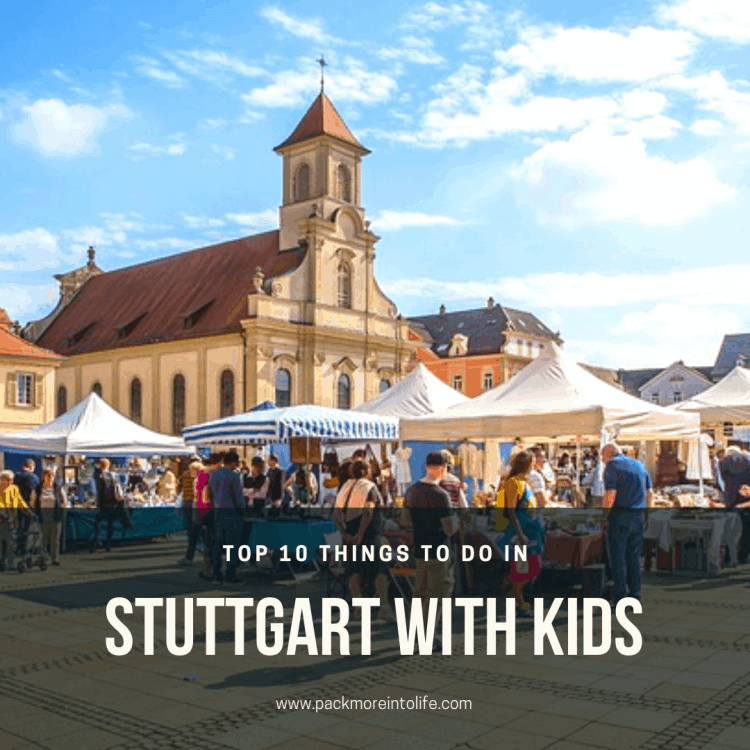 So that’s the Top 10 Things to Do in Stuttgart with kids. One of the best things about living in the area is all the amazing Stuttgart attractions to explore! Feel free to leave me a comment or message if you have any questions. Want to read more about our travels, including tons of European adventures, head over to my destinations page to check out my interactive map! I also have a huge guide to all the places that we’ve travel to Europe, so check that out for some great tips, ideas on where to go and more! Check out our social media channels. We love connection with other traveling families! Like this article? Want to save it for later? Check out these pins!